Estonia joined the countries that have invested in space technology five years ago. Back in 2013, the first Estonian nanosatellite, ESTCube was launched by the University of Tartu with Tallinn University of Technology (TalTech) as a partner. Fast forward one year. In 2014, TalTech took the initiative to create its own student satellite, which also marked the start of the biggest interdisciplinary study project in Estonia. Today, we are proud to say that the nanosatellite, which was to be completed this year for the 100th anniversary of TalTech is ready. In the coming summer, it will start its mission: Earth observation. Over 200 students have been working hand in hand with their supervisors over the last four years to launch the most advanced space-craft created in Estonia. While many enthusiastic members of the TalTech Space Programme graduated before they could see the result of the five-year project, new students have joined in. Currently there are 50 students from different institutes involved with the project, covering various space-related study and research areas from space law to engineering and data communication. 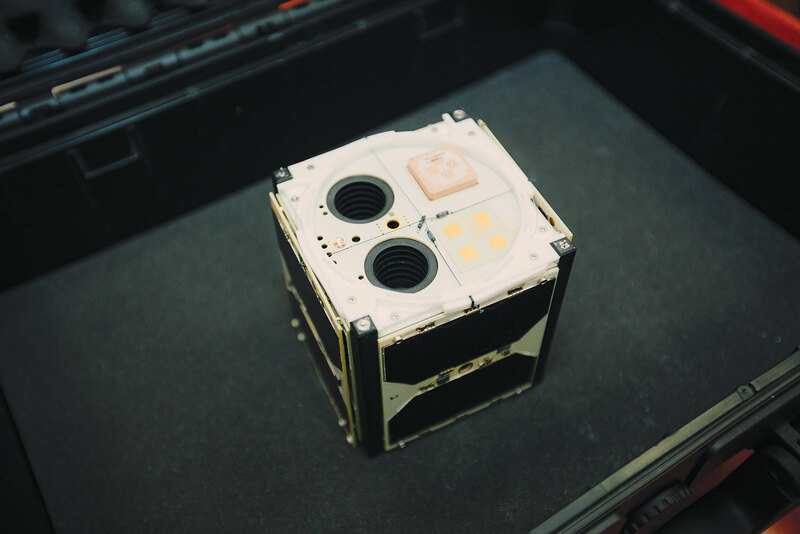 The TalTech nanosatellite measures 10 cm on each side and its main focus is Earth observation. In addition, several important scientific tests have been planned that haven’t yet brought successful results for similarly sized space-crafts. The TalTech nanosatellite will use two cameras to capture images and video footage of the Earth’s surface. RGB and NIR cameras evaluate the environmental situation using both visible and invisible light. The student satellite will communicate with its Ground Station, which will be built in the TalTech Campus in Tallinn. The most visible part of the station will be a 5-metre dish antenna on the roof of TalTech Mektory Innovation and Business Centre. This will be used to receive rapid X-band 10.5 GHz data drom the satellite during the minutes it passes over Estonia. It will be the first time ever that X-band is used in such a small space-craft. Additionally, the satellite will use traditional UHF to communicate with Ground Station. The second important test is planned with optical communication and it will involve LED and laser diodes. While passing over Estonia, the satellite will turn itself towards the Ground Station at TalTech campus so that the sensors on the telescope can receive light signals. Space is an incredibly difficult and hostile environment for common electronics as the radiation from the sun causes random bit changes in the processors and in the memory of the satellite. This further underlines the importance of testing fault tolerance, which the TalTech Space Programme team is aiming to accomplish. During the tests, the computer aims to detect and repair the random bit changes. In addition, the satellite team also plans to experiment with photo and video editing, which will be a worldwide innovation should it be successful. The TalTech Student satellite will be handed over to SAB Aerospace in March 2019. The company will integrate the system in its Vega rocket, which will launch from the European Space Port in French Guiana in summer 2019. The satellite will have a polar orbit – it will fly over the poles to allow observation of Earth from every angle. The Space Programme has given TalTech students a variety of extracurricular knowledge and experience in the most important area of the space industry: Earth observation. The data received from the nanosatellite can be used by organisations in a variety of industries. For example, such information is needed for environmental protection and prevention of natural disasters.